Eurofins BioPharma Product Testing Netherlands provides solution for high-end solid-state characterization of raw material and drug products. XRPD, Solid-State NMR, DSC, TGA and DVS methods are available for Analytical R&D projects and QC testing, Applications are running under GMP (EU-GMP and FDA inspected). 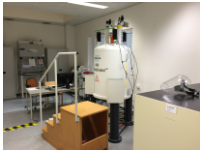 The scope of our capabilities and expertise are centralized in the Eurofins Centre of Excellence for NMR and Solid-State Characterization in Oss, The Netherlands. We deliver you Solid-State NMR (ssNMR) method development and testing services on ingredients, polymers, pharmaceutical drug substances and pharmaceutical drug products, under GMP. Our state-of-the-art equipment allows for high capacity, optimum sensitivity and fast turn-around, supporting development and product release. We are a leading laboratory in Europe providing access to GMP-certified ssNMR services. We deliver you XRPD (X-rays Powder Diffraction) method development, validation and testing services on raw materials, and pharmaceutical drug products, under GMP. Our state-of-the-art equipment allows for high capacity, optimum sensitivity and fast turn-around, supporting development and release activities. Particle size is measured by the dispersion and absorption of light (red and blue) generated by a laser using either the wet or dry dispersion techniques. At Eurofins Spinnovation Analytical, we have a Malvern Mastersizer, using the wet dispersion technique. Volume requirements: from 0.1 g – 10 g per sample determination for wet dispersion. Particle sizes: 10 nm –1500 μm for wet dispersion with Hydro MV, and 10 nm –200 μm for wet dispersion with Hydro SV. Contact our team of specialists for questions and requests about solid-state characterization and testing services: Contact us here.